David William Hall, 62, of Groveland, Fl., passed away November 30, 2018. He was born June 29, 1956 to Glenn W. Hall and Marilyn F. (Horak) Greenman (previously Hall) in Erie, Pa.
David was a member of St. Mary of the Mills Parish, The American Legion, Knights of Columbus, Trilogy Orlando Veterans Association (TOVA), and Trilogy Catholic. He recently retired from the Department of Defense at DISA. 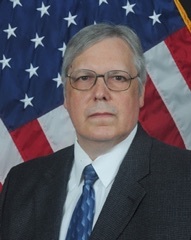 After four years active duty in the United States Air Force as a Computer Programmer, he spent an additional thirty years in the civil service, retiring as Chief of the Systems Engineering and Integration Branch. He retired with many honors and awards for exemplary service to our country; that he loved. He enjoyed ancestry research, working with the Boy Scouts of America as Den Leader, Scout Leader and Venture Crew Leader, serving his parish as school treasurer, treasurer for the HOA at Patuxent Glen, service in many other roles, and most of all, having fun with his sons and wife. He is survived by wife Cheryl (Allen) Hall, sons Jeremy (wife Anastasia) and Stephen Hall, mother-in-law Barbara Allen, brothers Dan (wife Joan), Dale (wife Mary) and Douglas Hall, sisters-in-law Tracy (husband Bill) Smuts, Paula (husband Michael) Simmonds, and many nieces and nephew. He was preceded in death by his beloved son Shaun Patrick and mother Marilyn, father Glenn (Bill) and father-in-law Gail B. Allen. Visitation will be on Sunday December 9, 2018 from 2-6 PM at the Donaldson Funeral Home, 313 Talbott Ave, Laurel, MD 20707. A Funeral Mass will be celebrated Monday December 10, 2018 at 11:00 AM St. Mary of the Mills Catholic Church, 114 St. Mary’s Place, Laurel, MD 20707. A graveside service will follow at the church cemetery.